Also known as Corbett's Tiger in honor of Colonel James Corbett, the Indochinese Tiger is a denizen of forests of Southeast Asia. It is second to Bengal Tiger in size and numbers in the wild. Average weight is around four hundred pounds for males and two hundred and fifty for females though larger individuals of up to five hundred and fifty and three hundred pounds respectively have been recorded in either gender. Body length is nearly eight feet for females and nine feet for males, though as with weight, variations in length are often recorded. Panthera Tigris Corbetti, the Indochinese Tiger is slightly darker in color than the average Bengal Tiger, having an ocher coloration with narrow stripes that often break up into a row of spots, and are less prominent on front legs. Underparts and inside of legs, chin and cheeks are white. Whiskers, treasured by Chinese pharmacies, are more prominent in males. A resident of dense forests and hilly terrains, the Indochinese Tiger is a solitary and nocturnal feline. Not much is known about this big cat owing to the remoteness of its habitat and the unstable political climate across most of its range that has prevented researchers to gain access to its terrain to study it until recently. It is believed to be quite strong and capable of taking even baby elephants as prey animals. Usually they hunt antelope, wild boar and buffalo though they have been known to supplement their diet with birds, fish, monkeys and reptiles. At times the Corbett's tiger has been documented to kill bears, leopards and even other tigers. 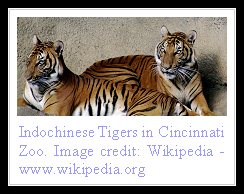 Indochinese Tiger is seen in the mountainous border regions of Cambodia, Laos, Myanmar, Thailand and Vietnam. The shaded red area show their current range that has shrunk drastically over the past century and the tiger is now recorded in scattered parts across these countries, segregated by human population and thus suffering from inbreeding with its adverse genetic short and long term consequences. The tigers communicate by vocalizations and calling in the mating season. They stay together during the courtship after which the male moves on. Female gives birth to a litter of two to three cubs after a pregnancy lasting one hundred and three days on average. The cubs gain maturity by two years of age. Lifespan on average is fifteen years. There are only around one thousand Indochinese Tigers left in the wild, with estimates putting their current number somewhere between seven hundred and twelve hundred. They suffer heavily at the hands of poachers and the unstable political and economic situation in their native lands. Tiger parts are in high demand in China, Hong Kong, Taiwan and Vietnam where the bones are ground into powder and skin, tail, whiskers and other parts are put into various uses for the traditional medicine makers. There is no scientific evidence of any benefit of using tiger, rhino or other animal parts as aphrodisiacs or curative medicines for ailments, but the unfortunate animals continue to suffer. The poor locals see no harm in getting rid of potentially harmful tigers and selling them to illegal trading rings for good money. Governments in that part of the world are focusing on logging and developmental projects that continue to shrink forests and bring the tiger ever closer to the edge of extinction. If the Indochinese Tiger is to survive in the wild, the people and authorities of Southeast Asia have to see it as an asset that can benefit their ecotourism industry enormously. At the moment the beautiful cat is still classified as Endangered. tigers are a wonder piece of life and they do not deserve to be killed from human people. they did nothing to us. all they want is to live and have a family just like people. image that happening to u and u cant because, your family and friends are being killed eveyday by other people. its a just plain horrible. people need to change the world and i am planning on doing just that!!!! !all humans can change by not killing all animals. u can killed farm animals and other animals but just not wild happy animals that have a right to live in the wild!!!! O.M.G! THE. COW. GOES. MOO.!!!!!! Stop killing the tigers. It is outragious. we must stop killing tigers is it fair is it just. if we harm them why should they not harm us it is unexceptable. STOP TIGERS FROM BECOMING EXTINCT. Animals are equal to humans. i dont understand how we could do these horibbal things to the poor creatures!!! <3 them not kill them! If you want to do something get off your backside and stop cheering people on from the sidelines. You americans are all the same. Tigers don't kill bears. Great site but there is a bit of dodgy information. Even wikipedia is not entirely trustworthy. You can edit the webpage on wikipedia. Thank you for sharing! There are so many type of cats.